With such beautiful spring days here in Paris, we’re taking full advantage of being outdoors, whether in our sunny courtyard, or in the local parks and gardens, like the Buttes Chaumont nearby. But sometimes one of the best parts about living in Paris is leaving Paris. In the past, getting out of Paris on a sunny weekend wasn’t always an option: work often kept me indoors. And for kitchen workers, indoors sometimes means underground, especially in Paris. When the other chefs and I finished our shift, we’d leave the kitchen half-blind, blinking in the bright sun once we were outdoors. No longer! Now I teach my cooking classes in a sunny kitchen, which also has a glass-roofed dining area, and even a tiny yard behind it, full of herbs and flowers. The fresh air coming from the neighboring park is perfect for picnics too. But sometimes it feels great to just get out into the country, so a week ago, that’s exactly what David-Nicolas and I decided to do. We hopped into our rental car and headed south of Paris to the Essonne department, to visit the oldest watercress farm in Ile de France. I’d heard the Essonne was a particularly green place to go, since a friend of ours had recently filmed a movie on location near Milly La Forêt. Another friend, Julie, recommended seeing Jean Tinguely and Niki de Saint-Phalle’s Cyclop near Milly – an impressive 74-foot (22m) high sculpture dating from 1969. In the nearby village of Barbizon, we also got an eyeful, courtesy of the painters who worked there in the mid-19th century. But our first destination was La Cressonnière Sainte Anne, established in 1856, and located in Vayres sur Essonne, about 40 miles (65km) from Paris. When we finally found the old dirt road leading down to a wooden barn, we half-expected to be greeted by a gruff old-timer, ploughing fields, or doing whatever it is that farmers do right now – plant seeds, maybe? 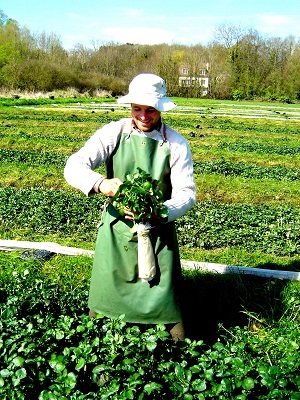 Mikaël Morizot was a pleasant surprise: a young and energetic (and rather handsome) second-generation watercress farmer, Mikaël showed us the long, watercress-filled ponds he was harvesting by hand. 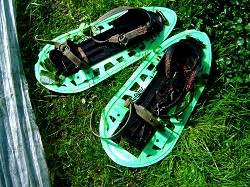 His ancestors used to work on long wooden boards stretched over the rectangular pond, but Mikaël wore on his feet a pair of ingenious snow-shoe-like contraptions, so that he could walk directly in the water, and save himself (almost…) from a gardener’s bad back. In classic French cuisine, watercress seems like an afterthought: a little sprig of it is often placed next to a roasted chicken or rib of beef. I’d only made it in soups before, and thought it was too peppery and fibrous to eat raw. 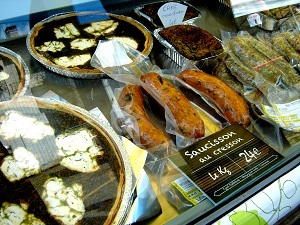 But after visiting Mikaël’s farm, where he told us about a watercress festival happening that very morning in a neighboring village, we sampled plenty of foods with both raw and cooked watercress: butter, sausages, quiche, and even watercress wine! Watercress is packed with vitamins – among others, vitamin C and about 3 times as much calcium as spinach – and it supposedly has cancer- and hair-loss preventing properties. Does that mean there weren’t any bald Romans? Because they sure liked the stuff, and medieval diners also appreciated the mustardy flavor. In fact, one of the very first cookbooks in France, Le Viandier (which I mentioned in a previous article) has a recipe for watercress with beets, oil, and almond milk, with either butter or cheese, and the author claimed that “When seasoned with salt, this cress will be much liked.” Hmmm…. Much liked? I prefer more contemporary recipes, like the one below. I hope you do, too – bon appétit! This salad is wonderful: the combination of smoky grilled shrimp, peppery watercress, and sweet mangoes is a little bit of magic, for which I cannot take credit – nature just designed it that way. You can buy mango vinegar at some Whole Foods stores, or order it here. Otherwise, substitute red wine vinegar or cider vinegar. Also, if you don’t have a grill or griddle handy, you can just sauté the shrimp on medium-high heat in a little olive oil. Voilà! 1. About an hour before making the salad, marinate the shrimp by combining them in a medium bowl with the chopped garlic, lime zest and juice, 1 tablespoon of olive oil, salt, and pepper. Refrigerate, stirring from time to time. 2. Slice the mango pieces, and then cut these long slices in half crossways. The pieces will be a little irregular, but that’s fine. 3. In a large salad bowl, place the watercress and chopped cilantro. 4. To make the vinaigrette, put the mustard, vinegar, and salt in a small bowl or glass tumbler, and stir vigorously with a small whisk or fork until the mixture is smooth. 5. While continuing to whisk or stir, slowly add the olive oil in a tiny steady stream. Stop pouring from time to time and continue to mix so that the vinaigrette maintains a smooth, emulsified appearance. Continue this way until you’ve used all the oil. 6. Grill (or pan sauté) the shrimp over medium-high heat about 3 minutes on each side. 7. Just before the shrimp are done cooking, pour the vinaigrette over the watercress and toss well. 8. 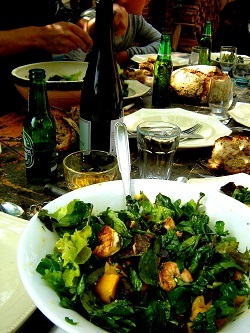 Add the shrimp and mango pieces, toss again, and enjoy this salad as a starter or a main course, with some crusty bread and a bottle of Chardonnay, bien sûr!